Well, it looks like some of Lucky Scooters most talented professional team riders, JonMarco Gaydos and Cody Flom, just recently met up for a session at one of California’s most well known skate parks. During their session together, it seems as though they were able to gather quite the collection of footage, which they have now released onto Cody’s YouTube channel for all of your viewing pleasure. It seems as though during the extent of the filming process of this video, these two phenomenal shredders ended up just performing a bunch of flairs, which is still somehow unbelievably entertaining to watch. I have always found it remarkable just how easy the younger generations of scooter riders are able to make flairs look. In this video, JonMarco and Cody seem to be able to flair practically anything they want in the skate park, which surprisingly makes for quite the enjoyable YouTube show. It is very clear based upon the footage featured through out the extent of this video that both of these very talented freestyle scooter riders have a competitive edge to their riding, which is most likely the reasoning behind this epic flair contest that both of them ended up taking part in during their time spent together at the skate park. These two dudes always look like they are having such a good time whenever they are riding their scooters, and it honestly makes you want to get out there and go for a shred yourself. Both of these guys have been very adamant about uploading brand new content onto their own personal YouTube channels on a regular basis, so if you are truly a die hard Cody Flom and/or JonMarco Gaydos fan than I highly recommend that you be sure to subscribe to both of their channels in order to stay updated on their personal content. On top of that, you can definitely expect to see both of these phenomenal Lucky Scooters pro team riders competing in the International Scooter Association’s infamous competition series, so be sure to keep an eye out for all of the future competition results to come because I am sure that at least one of these two absolute shredders is bound to nab up a podium spot at one of them. Anyway, if I were you I would highly recommend checking this entire video out on Lucky Scooters pro team rider, Cody Flom’s YouTube Channel, and you might as well check out the rest of his awesome content while you are at it because he has definitely been uploading plenty of great freestyle scooter content for all of you fans out there. 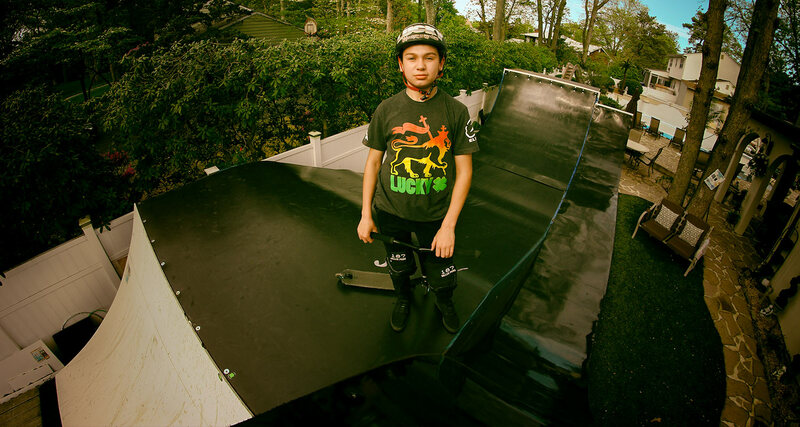 Also, be sure to stay tuned right here at the Lucky Scooters blog for more excellent team rider content and rider updates, along with any and all other future Lucky Scooters news, content, and updates. Shopping for new scooter parts? Click HERE!